On February 3, 1887, Frances Glessner wrote in her journal that her husband John brought home a large stack of photos of London. These photos happened to be from a series by the Society for Photographing Relics of Old London. Since the Glessners never visited London, the photographs, which are in the museum collection today, provided them with a picture of what the city was like pre-industrialization. In 1875, scholar Alfred Marks commissioned photographers Alfred and John Bool to photograph the Oxford Arms Inn in London. 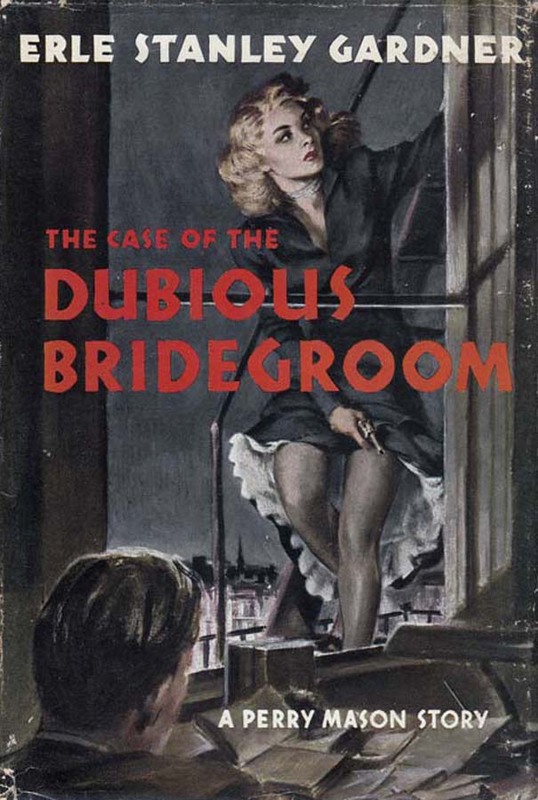 The commission was an attempt to document the building before its imminent demolition. Continuing this desire to document buildings in danger of destruction, Marks formed the Society for Photographing Relics of Old London. Over the course of 12 years, Marks and the members of the society published 120 photographs (the majority of which were taken by photographer Henry Dixon) of buildings they deemed significant that were in danger of being torn down. Although some of the buildings were destroyed, the complicated histories of three buildings photographed by the society prove that the passion Marks had for architectural preservation continued after the society published its last series of photos. This photo depicts the Temple Bar in its original location. The location of the Baroque arch denoted one of the main entrances into London from Westminster, and held great importance throughout London’s history. The structure photographed by the society is Christopher Wren’s 1670 design that covered the ancient road. 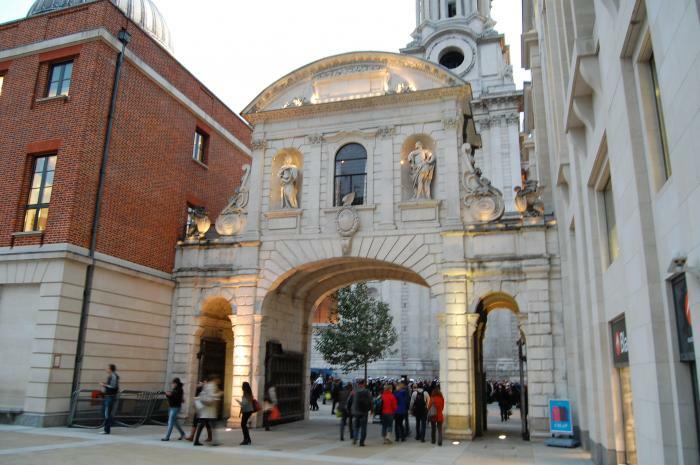 The gateway itself consists of many decorative elements, along with stone statues of Queen Anne of Denmark and James I on one side, and Charles I and Charles II on the other (the side from which the society’s photo was taken). 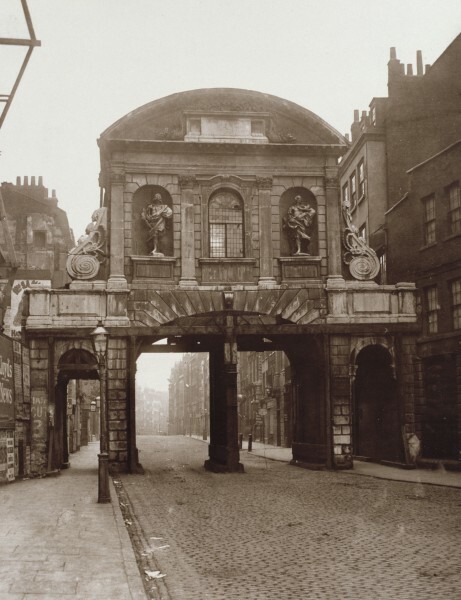 The gateway stood in this location for over 200 years, and infamously displayed the severed heads of traitors in the eighteenth century. As London grew more industrial, the gateway became problematic, as the arch made the street under it extremely narrow. At the publication of the descriptive letterpress in 1881, Alfred Marks noted that the Temple Bar was already demolished and replaced by a memorial. However, Marks was unaware of the events surrounding the monument’s demise: instead of being destroyed, the gateway was taken down stone by stone and stored by the Corporation of London, where it remained for ten years. 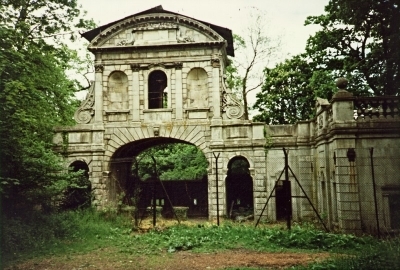 The gateway was later purchased by Lady Meux, a woman from a wealthy family based in Theobalds Park, and she had the Bar rebuilt in her estate. It remained there until 2004, when the Temple Bar Trust convinced the Corporation of London to fund its return to London. Since the original location still provided the same spatial issues as it did in 1880, the Bar was rebuilt in Paternoster Square in London, right outside of St. Paul’s Cathedral. 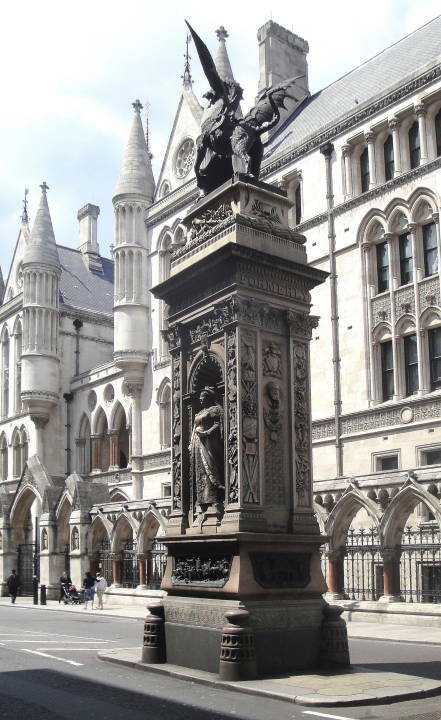 Both the Temple Bar and its 1880 monument remain a fixture of downtown London. 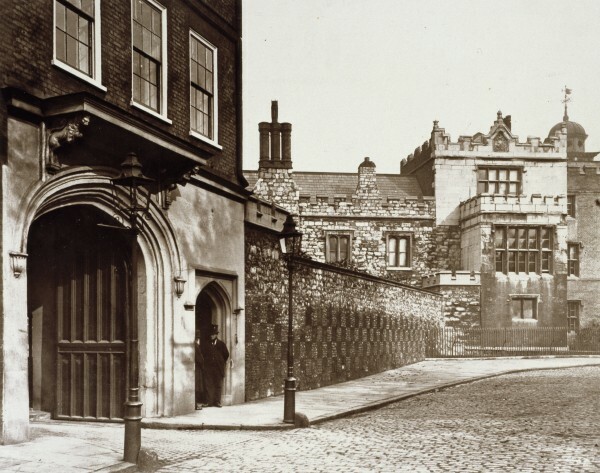 The most extensively photographed buildings in the collection are the Charterhouse Buildings. The twelve photos of the structure document nearly all facets of the building, and Marks notes that “London has few public buildings of equal interest with the Charterhouse, in respect either of historical associations or of beauty.” The Charterhouse was built in 1371 as a Carthusian monastery, which lasted until 1537. 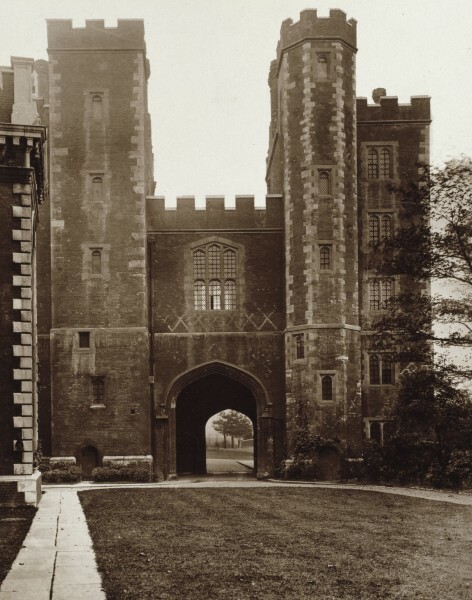 It was then converted into a mansion, and housed visiting royalty including Queen Elizabeth I and James I. In 1611, the building was purchased by businessman Thomas Sutton, who converted it once again. This time, the building was to be a charity house and school, specializing in health treatments and schooling for those less fortunate. 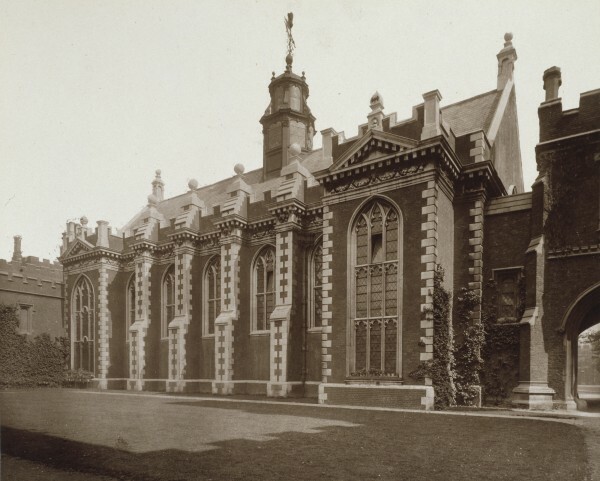 The Charterhouse School moved out of the building in 1872, but the school itself still exists today. 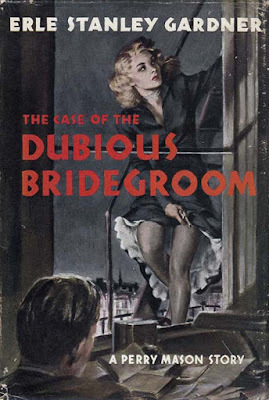 In addition to the fear of demolition that occurred around the time of the society’s photos, the building also endured World War II. After extreme damage during the Blitz bombings of 1941, extensive renovations and repairs were undertaken in the late 1950s. Today, the house remains an almshouse (supporting those in need of financial assistance), and also functions as a museum. 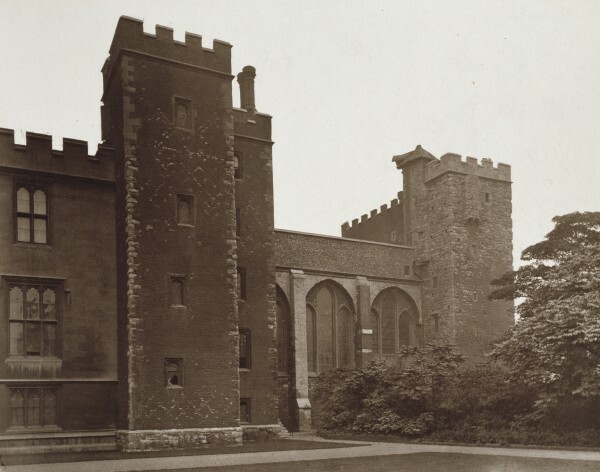 Another building that the Society for Photographing Relics of Old London was especially interested in was Lambeth Palace. The palace dates to 1262, and since then it has been the primary residence of the Archbishop of Canterbury. The society published three photos of this building, focusing on Morton’s Tower, Juxon’s Hall, and the Water Tower, respectively. The history of its construction and development is extremely complex, and many aspects have been added since its original dedication. The chapel in the church and its corresponding crypt are the only sections which remain from the thirteenth century, but many other aspects from later periods are equally impressive. 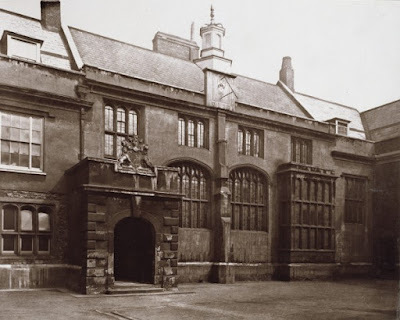 The majority of the building was constructed by architect Edward Blore in the 1830s with the goal of hiding the reminders of the English Civil War that marked the building. The subject of the first photo published by the society, Morton’s Tower (named after its architect), was built in 1490, and it remains in its original position to this day. 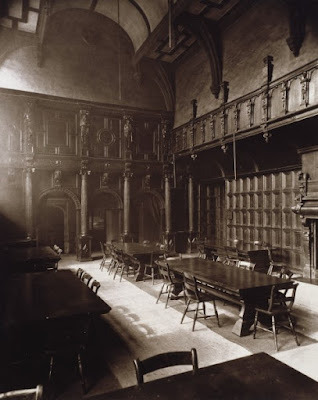 The second photo shows the Great Hall of Lambeth Palace, which has since been turned into a renowned library, and provides one of the site’s main attractions. 75: Lambeth Palace - "Lollard's Tower"
Unfortunately, the subject of the third photograph, Lollard’s Tower, did not completely survive to the present. 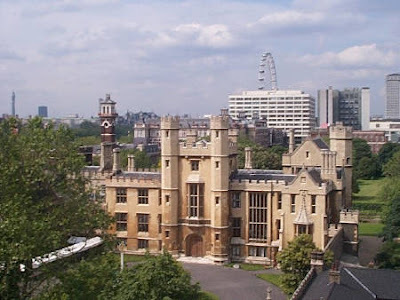 Like the Charterhouse and many other buildings in London, Lollard’s Tower was damaged by a direct hit bombing in 1941. The tower did not collapse and has since been reconstructed, but the original structure is incomplete. These three histories demonstrate the complications and difficulties involved in architectural preservation. Many of the buildings photographed by the Society for Photographing Relics of Old London did not survive to the present day, but the photos ensure that the buildings are not lost in the past. The histories of Temple Bar, the Charterhouse, and Lambeth Palace exemplify the amount of work, and, in some cases luck, necessary to preserve ancient buildings. Despite the short life span of Alfred Marks and his society, their impact and the buildings they documented live on through their work. Andrew Haberman is a history student at Loyola University Chicago and a collections intern at Glessner House Museum during the fall 2017 semester. Richardson’s first church design in Boston’s Back Bay is overshadowed by his monumental Trinity Church, which gave him a national reputation. The commission for the Brattle Square Church, received in 1870, was extraordinarily important in his career, however, in that it is the first of his buildings to feature the characteristics of what became known as Richardsonian Romanesque. The congregation of Brattle Square Congregational Church constructed its first building in 1699, and a second was built a few years before the American Revolution. By 1869, the Brattle Square area went into decline resulting in the congregation purchasing a prominent lot along Commonwealth Avenue in the developing Back Bay neighborhood. 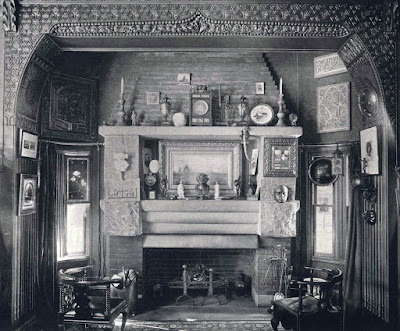 H. H. Richardson was among a small number of architects asked to submit designs, possibly at the suggestion of Benjamin Crowninshield, a strong supporter of the project and father of Richardson’s Harvard classmate, Benjamin W. Crowninshield, for whom he had designed a nearby house in 1868. 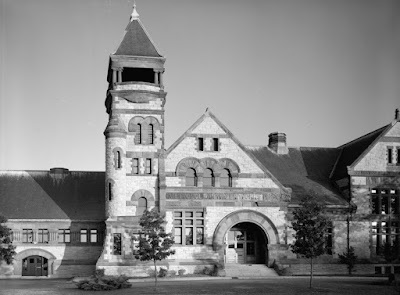 Construction began in 1871 and the building was finished in time to be dedicated just before Christmas in 1873. The higher than expected cost of the building, combined with a financial depression in the early 1870s resulted in the congregation filing for bankruptcy in 1876. Six years later, it was acquired by the First Baptist Church for $100,000 which soon after engaged another architect to design a chapel at the west end of the building. Galleries were added to the auditorium to correct acoustical issues in the original design. 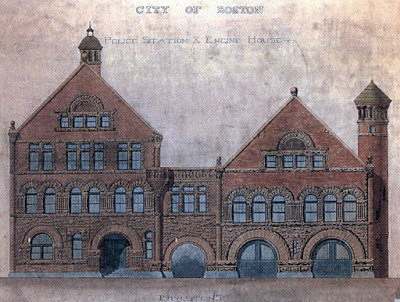 The building is cruciform in shape; however, one arm is so short that the auditorium is actually T-shaped, with a huge rose window at each end of the T.
The main axis runs parallel to Commonwealth Avenue, with entry off of Clarendon Street through an arcade consisting of three large arches composed of three different types of stone in shades of buff, cream, and red, set atop intricately carved foliate capitals. The floor of the entry porch is set with encaustic tiles in similar colors creating an overall harmony to the space. The stone used for the walls is a locally quarried Roxbury puddingstone, which works especially well for the Romanesque design, with the whole set beneath a roof of dark grey slate tiles set into decorative patterns. The building is dominated by a massive 176-foot tower which rests on four large piers framing arched openings that form a covered carriageway. The tower contains multiple arched openings of various sizes and is capped by a pyramidal roof clad in red clay tiles. Today, the church is in need of major repairs with canopies covering the sidewalks and scaffolding encasing the Bartholdi frieze. Richardson received the commission through a competition in the spring of 1872, of which he was one of six architects invited to submit. By the time construction began on the building itself in 1874, Richardson had moved his home and office to Brookline, so that he could closely supervise the building. 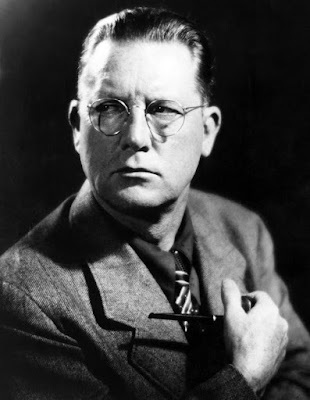 He would remain in Brookline for the remainder of his life, resulting in the largest concentration of his work being located in Boston and surrounding towns. Work began in 1873 when 4,500 wooden piers were driven into the ground to support the enormous weight of the building. Four huge piers in the sanctuary support the weight of the tower, and sit upon granite pyramids underground, measuring forty feet wide by twenty feet tall. This massive engineering feat was essential, given that the site sat in the middle of the Back Bay, a former swampy area that had been filled in over the preceding fifteen years. The overall plan of the building is in the shape of a Greek cross, with the Parish House extending to the northeast, reflecting the original irregularly shaped plot of land. The exterior comprises four different types of local granite and is trimmed with Longmeadow brownstone. Richly carved ornament is set amidst walls featuring Richardson’s trademark polychrome stone work, including checkboard and zigzag patterns on the front façade, and eight-petaled flowers on the apse. Inspiration for the overall design includes the French Romanesque which Richardson studied extensively during his years at the Ecole des Beaux Arts in the early 1860s. 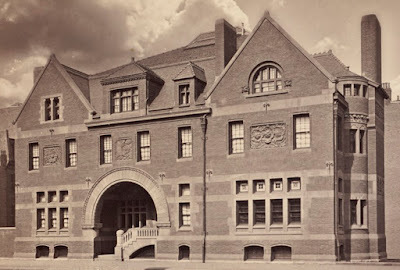 His refinement of the style led to what later became known as Richardsonian Romanesque and characterized the buildings in the later years of his career. The cathedral at Salamanca, Spain served as a model for the large tower. The interior features an exceptionally open auditorium for Rev. Phillips Brooks, a Harvard classmate of Richardson, considered one of the finest preachers of the late 19th century. A marble bust by Daniel Chester French dominates the baptistry, and was completed in 1897. It commemorates Brooks’ 22 years as rector of Trinity Church, and his two years as Bishop of the Diocese of Massachusetts, in which position he served until his death in 1893. The church features a dazzling collection of American and European stained glass windows. Five are by La Farge, including the Christ in Majesty window set into three lancets over the main entrance, and his New Jerusalem window in the north transept. That area features a series of windows by Sir Edward Burne-Jones for Morris & Co., who also designed the window, David’s Charge to Solomon, located in the baptistry. A humorous note is that Burne-Jones incorporated Morris’ image in the window, as the severed head of Goliath being held in the right hand of David. Other English windows include a series of seven surrounding the chancel by Clayton & Bell of London and several by Henry Holiday, also of London, including Three Scenes in St. Paul’s Life, shown below. The building was consecrated in February 1877 with the total cost of the site and building at $635,000. In 1897, Richardson’s successors, Shepley, Rutan and Coolidge, added the richly carved west porch, combining Richardson’s general scheme and the design of St. Trophime, a Romanesque church in Arles, France. The firm returned to add the massive sculptural pulpit in 1914. Architects Maginnis and Walsh extensively remodeled the apse in 1937-1938 to reflect the shift toward a more ceremonial form of worship. A major restoration and expansion was begun in 2003, and continues to this day, with significant work on the exterior being undertaken during 2017.